Ravens are the most widespread of all corvids (crows), ranging throughout Europe, North Africa, Western Siberia, North America and Greenland. 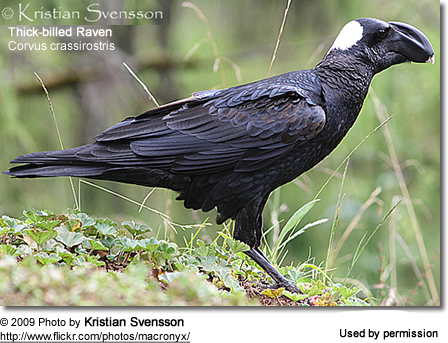 Most of us are familiar with the Common, or Northern Raven. 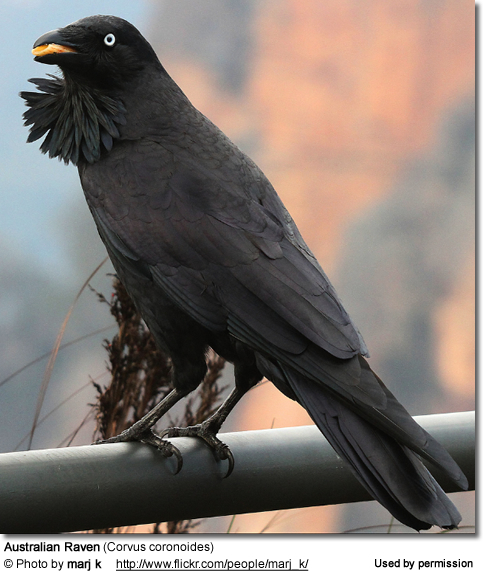 They are highly intelligent and share many of the same qualities as crows. Clever and resourceful, they adapt quickly to differing climates and terrains. This alone requires great intellect. They are known as problem-solvers, even solving problems created by scientists. Although ravens seek mountains and wilder landscapes, they also inhabit open forests, coastal areas, islands, deserts, grasslands and plains. More recently, ravens are being seen in cities and suburbs as their habitats shrink. They have adapted to living among people and use people to their advantage. In the wild they have been known to live more than thirty years. 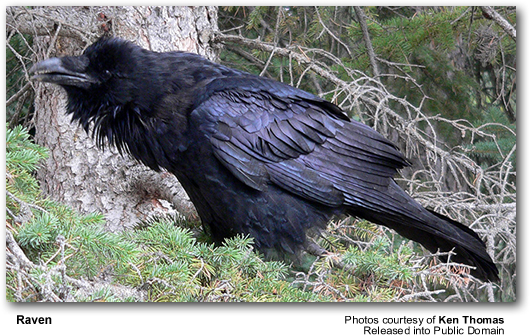 The Raven’s glossy, black body is massive, and its huge, thick neck is covered with sturdy, shaggy feathers. Its beak is hooked for tearing at meat in knife-like fashion. Their tails are long and wide. Most are completely black, although some have areas of white on their bodies. Their enormous wings carry them soaring across the sky. 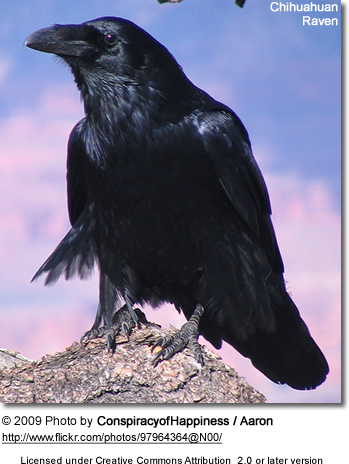 The Raven’s length is from 58 to 69 cm from beak to tail. Despite their size, their long wings make them graceful and agile in flight, enjoying their ability to soar, tumble and roll. Ornithologists credit their all-black plumage with enabling them to absorb and retain heat in the cold, northern climates. There can be some difficulty in differentiating them from crows. The body is not as bulky as a crow’s, and the wings are longer are more tapered than a crow’s. 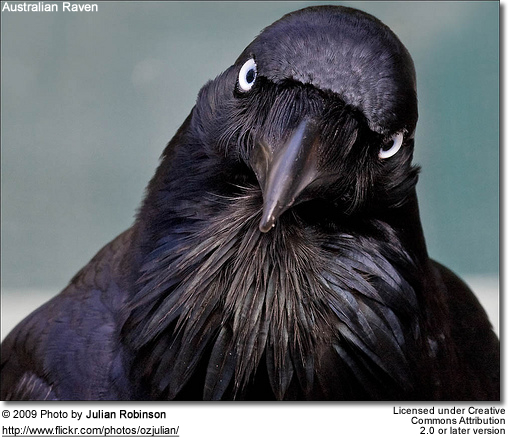 The Raven is larger, possessing a heavier beak, shaggy throat hackles, and a wedge-shaped tail. Its wing tips are long and fingered, and in flight, they soar and dance, flapping their wings far less than the crow. 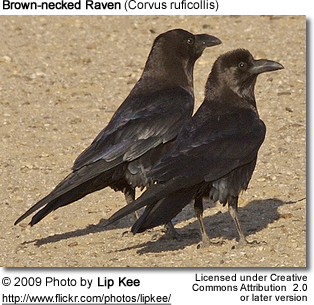 Similar to crows, Ravens are highly social birds, forming huge, tightly knit, family-based flocks. Most Ravens tend to travel alone, or at the most, in pairs, but they will roost and feed in large numbers. Ravens possess a voice that is quite unusual but easily recognizable. Its normal sound is a deep, harsh croak, resembling a hollow, croaking honk. They are capable of producing a vast number of sounds, including a knocking sound, “toc,toc,toc,” a “Kraa” sound, low guttural rattles, and even some calls that are melodious. This numerous, complex collection of sounds enables them to communicate over long distances. These huge flocks can be observed at mass food supplies, such as landfills. 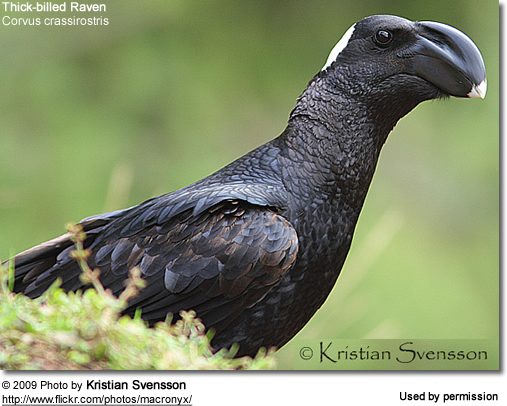 Ravens, like their counterparts, the crows, survive on carrion and are opportunistic scavengers. They always manage to locate a food source, no matter how bitter the winter might be. Other predators provide carrion; all they have to do is follow them to their kill and wait their turn at the carcass. They will even fly behind humans in their hunting parties in order to access food. They will kill when necessary. Ravens prefer to build their nests away from other Ravens. The nest is enormous, filled with sticks, branches, wool, rags, roots, and moss. They are held together with mud and dung. 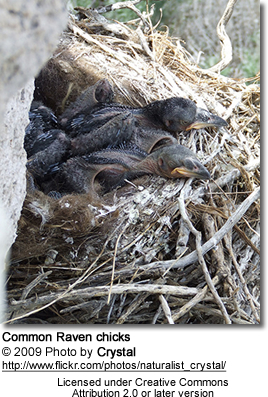 The nests are usually built in high trees or on cliffs, but some have been seen on old buildings or in low bushes or on the ground in rural, open land. The average clutch size is three to seven eggs. The female incubates the eggs for about twenty days, during which time the male provides her food. Both parents care for the chicks for six months. 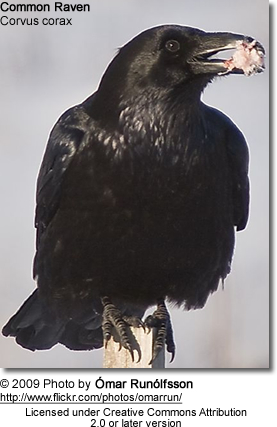 Common Raven or Northern Raven (Corvus corax), found in the Holarctic south throughout Middle Europe, North Africa, Western Siberia, Asia, Greenland.and North America to Nicaragua.